I knew there was a reason I was keeping my old Think Outside Stowaway Bluetooth keyboard from my Windows Mobile days. Windows Mobile and for that matter Blackberry and Palm had Bluetooth keyboard profiles in 2005. Apple has finally implemented the keyboard profile for both the iPad and now the iPhone. The Apple keyboard profile is compatible with the Think Outside (acquired by iGo) StoweAway keyboard. 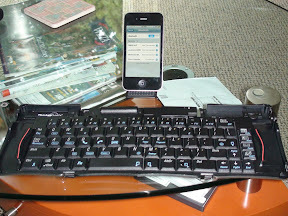 Here is a picture of my 5 row Bluetooth keyboard paired to my iPhone 4. The fn + key don't seem to work which makes sense but otherwise it is fully functional. There is also a smaller 4 row keyboard which is available on eBay northwards of $170. It has crossed my mind to sell it but I like the portability. Did you have to do anything special to get them to pair? I have the keyboard and it is not showing up on iPad or iPhone 3GS running iOS. I put the keyboard in pairing mode (make sure you have fresh batteries), then on the iPhone I went to settings/general/bluetooth, waited for the KB to show up, 1-2 seconds later a popup was displayed with a number to key in on the keyboard. Once you key in the number you press enter. The keyboard should now be connected to the iPhone. This an iPhone 3G 8GB 16GB Replacement Home Button with the Flex cable. Fix your Home Button Problems with ease! Most online sites offer these seperately, causing confusion! Our product is plug-n-play! This is will fix your broken home button! Its very easy to Install!